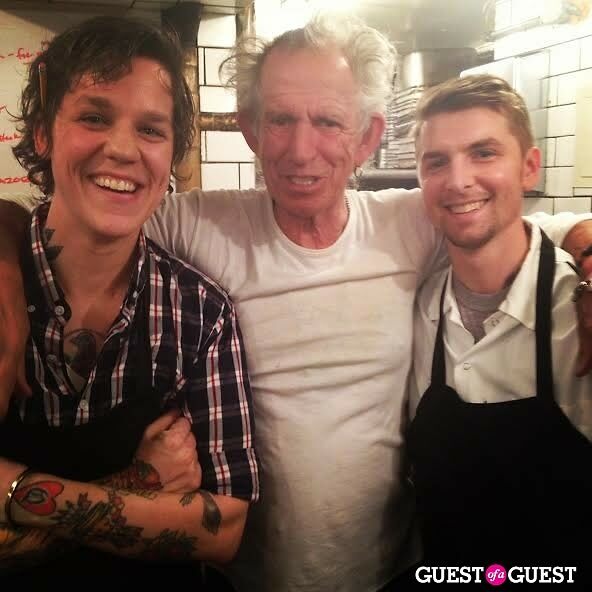 Check out our EXCLUSIVE Photo of the Day and find out why we found Keith hanging in the kitchen at the Waverly Inn! While the VIP-frequented eatery has a notable history of pleasing its guests, the Waverly Inn appears to have outdone itself, earning a certified stamp of approval from everyone's favorite Rolling Stone. So here's the dish: Executive Chef Ashley Merriman (who you might recognize from Bravo's "Top Chef") is engaged to Keith's second cousin. The familial ties, combined with Ashley's love for the Stones, led her to the fact that Keith's a major fan of Shepard's pie—so when he came in to dine, she decided to surprise him. Along with the entrées, she sent him and his guests a few specially-made pies that ended up causing quite a stir. "How did she know?" exclaimed Keith's manager, Jane Rose. She wasn't the only one who was impressed—the rock star was so delighted by the surprise pies that he paid a visit to the kitchen to thank the chefs themselves. What a guy! *Disclaimer: the owner of the site, Rachelle Hruska, is married to the Waverly Inn owner Sean MacPherson.